My 10-year-old saw the cover of this and asked, "Mom? Why would he say he was born a crime?" --I found myself trying to explain apartheid and fear and government control and racism in the shortest, most kid-level way I could...It's hard, you guys. But it's also so necessary, and to read this moving memoir by Trevor Noah--someone we could easily, simply, see as just another successful, approachable, clever comedian--was a lesson in itself. 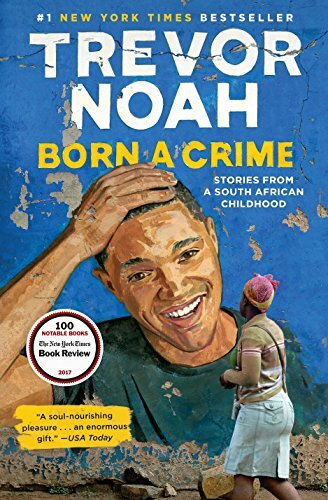 Noah is frank, matter-of-fact, and humble as he talks about his early years as a "naughty as s***" boy, but also as a child with a deep love for his feisty, faithful, strong mother, who came of age in a family broken by apartheid, and who maneuvered his way through the complex maze of South African social constructs, and still managed to rise from a life of unimaginable poverty to seemingly overnight (it wasn't overnight, not by a long shot) fame on The Daily Show. I picked up this book because of both my interest in a personal account of living under apartheid and the simple fact that I anticipated Trevor Noah would be as clever and witty as he is on TV--and was rewarded on both accounts. Noah brings 1980s South Africa home in a way that is humbling--and entirely compelling--for his reader. I couldn't put this book down. This sounds fascinating! Love your book reviews!